Chief Minister Prem Kumar Dhumal today laid foundation stone of residential complex of Government Degree College, Shillai to be constructed at a cost of Rs. 1.34 crore, ITI building, Shillai to be constructed at a cost of Rs. 2.34 crore and additional block of Community Health Centre (CHC), Shillai to be constructed at a cost of Rs. 1.03 crore in Sirmaur district today. Chief Minister also laid foundation stone of Government Degree College building at Sarahan to be constructed at a cost of Rs. two crore, Tehsil Office building to be constructed at a cost of Rs. 1.53 crore and Tourist Hut to be constructed at a cost of Rs. 55 lakh at Sarahan in Sirmaur district. He also inaugurated additional accommodation for Government Senior Secondary School, Sarahan. 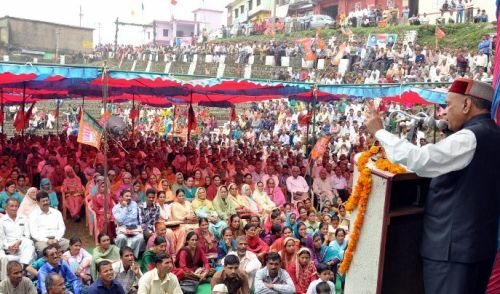 Addressing a public meeting at Shillai and Sarahan, Chief Minister claimed that balanced and uniform development was being carried out throughout the State by rising above political considerations. He said that special attention was being paid to those areas which were remained neglected so far. He stated that road, health and education had been accorded top priority and added that educational institutions of repute were being opened in the State so as to provide quality education to the youth at their door steps. He said that Atal School Uniform Scheme had been launched by the State Government from district Sirmaur under which two pairs of uniform were being given to every student of Government schools upto 10th class by spending Rs. 64 crore. 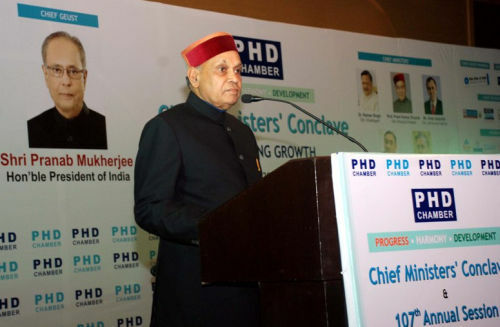 Prof. Dhumal said that Rs. 34 crore had been spent on various developmental activities in Shillai area besides 15 villages were provided road connectivity and 23 government buildings were constructed during last four and a half years. He sought the support of people for implementing the policies and programmes of the State Government effectively in future too. Sukh Ram Chaudhary, Chief Parliamentary Secretary welcomed the Chief Minister and said that various technical and educational institutions had been opened in Sirmaur district during last four and a half years. Baldev Tomar President, District BJP welcomed the Chief Minister and thanked him for accelerating the pace of development in the area which remained neglected during the previous government regime. Dr. Rajeev Bindal, MLA and former Minister, Virender Kashyap, Member of Parliament, Balbir Chauhan, Vice Chairman, SC/ST Development Corporation, Sohan Singh Thakur, BJP Mandal President, Shillai, Dayal Pyari, Chairperson, Zila Parishad. Dilip Singh Tomar, Former District President BJP, Amar Singh Chauhan, Senior BJP leader were also present on the occasion among others.